Earlier this month I reported in the blog about a day on Hoggarths Farm with Ray, Chris and Andrew Calvert. For them it was another day of hard graft, rounding-up sheep and lambs for tagging and going about the many daily tasks associated with the lambing season. By contrast my second day with the Calverts is a more recreational one. Ray is Secretary to the Tan Hill Open Swaledale Sheep Show, to give it its full title. Brother Chris is a steward and Ray’s wife, Alison, is on the gate selling show programmes. Meanwhile Ray and Alison’s son, Andrew, is entering his sheep in several classes and hoping for success this year. Tan Hill is a big event in the Calvert’s farming and social calendar. Meeting Ray on the morning, he is virtually unrecognisable dressed in shirt, tie and jacket. Last time I saw him he was in overalls and woolly hat. He has scrubbed-up nicely, as they say. In addition to his duties as Show Secretary today he also has to help Andrew unload and handle the Swaledales. Amazingly, despite the best efforts of the sheep, Ray seems to manage to keep his shirt and jacket clean throughout the day. Sheep are arriving for the show and being penned throughout the morning and before the judging starts the annual pre-show drink and dinner takes place for committee members and guests inside the Tan Hill Inn. Then at 12.30pm everyone’s outside for the judging. Andrew has entered stock in several tup and gimmer classes and needs a bit of assistance from Ray with the handling where there is more than one sheep entered in a particular class. Sheep can get very frisky, leap in the air and need some firm holding back. In this respect Swaledale sheep have prominent horns which act as convenient ‘handles’! As the afternoon progresses it is proving to be a very successful day for Andrew and the Calvert sheep pen is soon festooned with coloured rosettes. He wins small breeders ewe, first and second in the small breeder gimmer shearling and second in the small breeder tup hogg class. Also, first prize small breeder tup of any age and champion small breeder. The family are very happy with the prizes in the face of tough competition. While on the face of it Tan Hill may seem like a small event, it is very important and significant as a specialist show for Swaledale sheep breeders. Andrew is particularly delighted to be small breeder champion, as the family have never achieved this before. 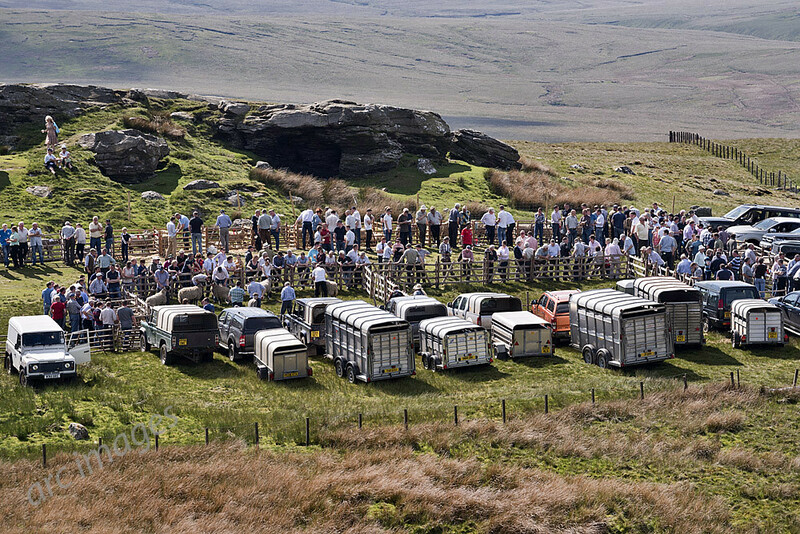 As the final classes for best sheep in the show are judged the 64th Annual Tan Hill Show draws to a conclusion. The sheep are herded back into their trailers and the temporary wooden pens are dismantled. The site is soon back to rugged moorland as show-goers head off back to their farms or drop into the Tan Hill Inn to celebrate.